Transformed from a summer cottage into a full time residence this classic lake house is modernized for contemporary everyday life. Historically inspired details and maritime sophistication celebrate its traditional role as a family getaway for weekend and holiday fun. Emblematic of what is happening on lakes across South Eastern Wisconsin, a couple with grown children wanted to transform their summer retreat on Lake Geneva into their permanent residence by building and designing a new classic lake house focused on hosting extended family all year round. Peabody’s Senior Interior Designer Emily Winters expertly mixes traditional and contemporary style while nodding to the clients’ passions, personality and collections from their former Tudor Style home on Milwaukee’s East Side. 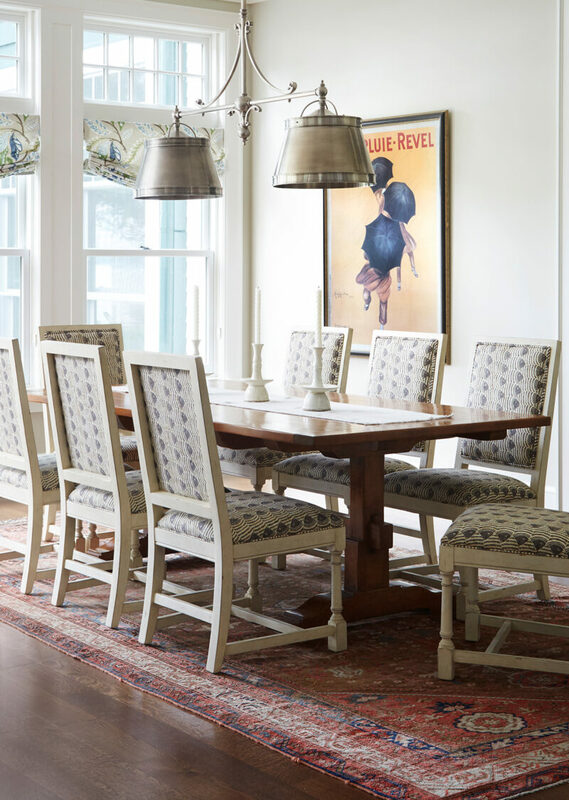 Over all bright white, shades of blue and warm wood tones showcase favorite oriental rugs and vintage posters combined with fresh stripes, new textures, wicker and polished chrome finishes. Nautical details like ships wheels, compasses, antique brass fixtures, charts and maps subtly highlight its sublime waterfront locale.